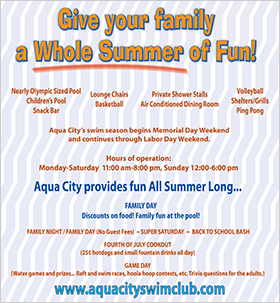 Aqua City has a friendly and experienced staff. All Lifeguards are skilled swimmers and knowledgeable in the application of lifesaving, first aid, surveillance and rescue techniques as well as holding current certifications as lifeguards by a recognized source of training (Red Cross, YMCA). Most of our staff offer private swim lessons. We take pride in a clean, safe, and family friendly atmosphere. We’re confident you will enjoy your summers here with us.